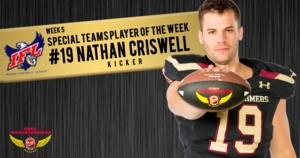 DES MOINES - Iowa Barnstormers kicker Nathan Criswell was named the Indoor Football League’s Defensive Player of the Week for Week 5, the League announced today. Criswell (5-11, 195, Iowa Central CC) earned IFL Defensive Player of the Week Honors after a perfect performance against the Nebraska Danger in week 5. In a back and forth game built on big plays, every point counted and Criswell’s consistent and reliable play helped make a difference in the team’s victory. Criswell converted his only field goal of the night and made all seven of his extra point attempts, helping to keep the team’s winning streak alive as they squeaked by the Danger 58-55. The Indoor Football League awarded quarterback Lorenzo Brown of the Sioux Falls Storm with Offensive Player of the Week, while defensive back Bakari Triggs of the Green Bay Blizzard earned Defensive Player of the Week. Criswell and the Barnstormers look to maintain their solid start to the season in week 6 as they travel to face in-state rivals the Cedar Rapids River Kings. The team will return home to Wells Fargo Arena on Saturday, April 6 to once again face the River Kings. Kickoff is scheduled for 7:05 p.m. Contact the Iowa Barnstormers front office for tickets 515-633-2255. The Iowa Barnstormers are hosting 90’s Night on Saturday, April 6 as they take on in-state rivals the Cedar Rapids River Kings. Fans are encouraged to dress to the theme as we jam out to 90’s tunes all night long. Fans in their best 90’s attire will be randomly selected to win prizes throughout the night! Don’t miss out on the high-flying action, contact the Barnstormers front office at 515-633-2255 for tickets.